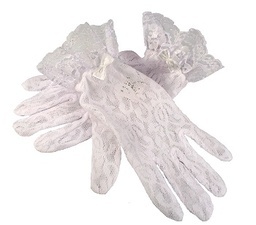 The palms and fingertips of these white lace gloves are threaded with platinum. While wearing these gloves and handling an inanimate object, you can learn details about that object’s previous owner through the psychic impressions it has accumulated. The amount of information revealed depends on how long you study the object. 1st minute: Last owner’s race. 2nd minute: Last owner’s gender. 3rd minute: Last owner’s age. 4th minute: Last owner’s alignment. 6th+ minute: Next-to-last owner’s race,and so on. Gloves of object reading will not identify casual users as owners. (Anyone who uses an object to attack someone or something is not thereafter considered a casual user.) An object without any previous owners, or without any owners in the past ten years, reveals no information. If you employ these gloves additional times on the same object, the information yielded is the same as the first time. Akira bought these in Sigil after returning from Limbo.